Kajsiab began many years ago with just a few wooden planks to show visitors the unique handmade artwork the women from the mountains make. Soon we had a real shop; The Woman Empowerment Shop we named it, to provide help for women, right at the Daauw Home Restaurant. A few years later we built the Women's Workplace, where the local women make embroideries and other artworks, using their traditional skills and adding a modern touch. Many workshops have been done in the past years and eventually drawing, making notebooks, painting and making embroideries are the workshops that are succesful, not only by selling them but also in making them. The Women;s Workplace is also the center ofInformal computer classes, English conversation classes and informal talks about sexual education, raising children, healthy equal personal relationships and hygiene. The Kajsiab team will buy this year a video projector to show information, short movies and documentaries about sexual health, pregnancies, women and health, nature and world issues, collecting garbage, and other important educational issues. People can order the local products that the women make in the Workplace and in the Villages online too. The women from the workplace can make up to 50 or even 100 pieces as long as they realize that all products are unique and colors will always be slightly different. The women in the villages make unique products of which each item is different. The women from both groups mostly make bags, wall hangings, pillowcases, notebooks, passport holders, earrings,necklaces, and clothing. There are no local -night - markets around but that might change depending on the future plans of Bokeo province. Buyers of the products are mostly visitors of Daauw Home, volunteers and the group of people all over the world that is connected with Kajsiab and order online. The Women’s Workplace has tried a lot the past years and we are all proud and happy that we now have our own product line; Kajsiab Creations. The women of Kajsiab Creations can generate a sufficient income with their work . Kajsiab Women's Workplace is since this year able to buy all the new fabric from the income instead of donations and even give a percentage to the running costs of the Women’s Workplace. There is no other profit or middle person which means the percentage the the local women get is fair. The circle is almost round, thanks to the generosity of the sponsors, the persistence, vision and realism of the Kajsiab Team in the Women’s Workplace, the local women and the traditional knowledge and skills of the women of the mountains in Laos. Nai arrived two years ago in Kajsiab Shelter. She was traumatized because of the mothers’ death. She also was taken out of school to work on the rice fields. Nai stayed more than half a year in the Shelter to try to find her own self and her own balance again. After that she became more loose and even laughed sometimes. She wanted to go back to school. Because of the help of some of the volunteers she was able to go to sewing school. Within one year she was the best of her class and Nai started working in the Women’s Workplace and also got orders from her past teacher. 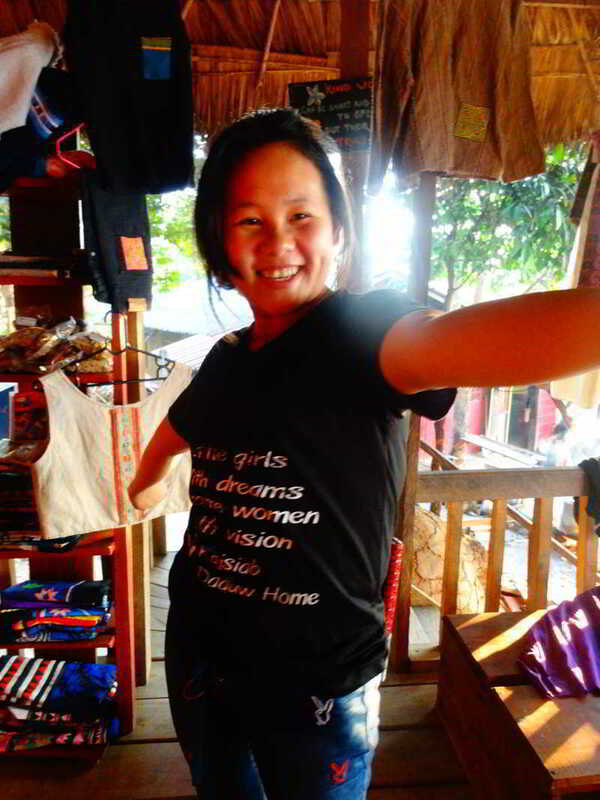 In the workplace Nai learned to make new products with the old knowledge of her own people. She also learned business skills. This summer Nai is doing a cooking class in cooperation with a German NGO. Nai wants to keep learning and is very determined. She is also still struggling with her own identity and is emotionally not stable. For now she will stay in Daauw home, Kajsiab Shelter to learn more skills and to get a stable base to develop herself to be able to create a happy and healthy future. Mia Pawau arrived with her husband in Kajsiab Shelter about three years ago, because she felt she was going to have a complicated delivery. She was right and at the end of 2012 she gave birth to Paulo, a premature baby and now, two and a half years later a healthy and happy toddler. To pay for the hospital bills Mia Pawau’s husband worked more than half a year at Daauw restaurant and mother and baby had the time and space to become healthy and strong again. After a while Mia Pawau helped out in the restaurant and the shelter and worked with the Kajsiab team to launch the Women’s Workplace. Last year the family left to start a new future. Her husband became a teacher in a small village and Mia Pawau created her own shop with local products. March this year Mia Pawau came to us to ask if she could stay at Kajsiab Shelter in early May to deliver her second child. In June she gave birth to a healthy baby girl Sai Fon. Mia Pawau makes authentic refreshing products and focuses now mainly on wall hangings of baby names and wall hangings with the daily life of her people embroidered in detail. 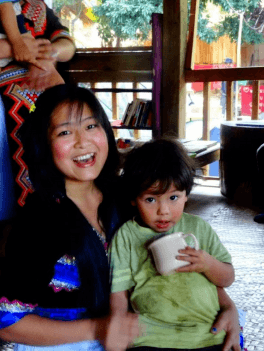 Mia Jaa arrived in Kajsiab Shelter in 2014 and developed from day one into an energetic and curious young woman who is not afraid to try new things and speak new languages She married Jaa, who also stays in Kajsiab Shelter. Mia Jaa will be a teenage mum. Mia Jaa helps out in the restaurant, the Shelter, the Kids Care Project and the launch of Women's Health Ambassadors. She also embroiders unique art works that are used on note books, T-shirts, bags and earrings. Mia Jaa wants to stay in Daauw Home, Kajsiab and wants to learn more, especially about Women Empowerment Projects and the projects in the Women’s Workplace. She wishes to share her knowledge that she will learn with her people, to keep caring for the Kajsiab Children and maybe in the future launch her own shop with unique products. She will be an experience expert in our workshops about women and health, teenage mums, sexual education, health of mother and child. - small embroidery work on the handmade notebooks, T-shirts, passportholders, bags, pillow cases. - wallhangings for new born babies. - necklaces, earrings, bags etc. The women will try in 2016 also to start working with companies and businesses (Christmas presents, presents for personnel), and will be working on unique orders (per ten pieces to distribute between friends and family), focussing on markets around the world or benefit events for Kajsiab. Kajsiab will upcoming year - with the Kajsiab women who work in the Women’s Workplace and with volunteers from all over the world - go to the mountain villages and do creative workshops. By doing creative work as drawing, painting, dancing and photography the women and girls will open up and feel safe and following the workshops we will have an open discussion. The group will be seated in a circle for an informal discussion between the women in the mountains, the women who work and live at Kajsiab and volunteers from all over the world. Carefully and informally we will try to speak about sexuality, being in charge of your own body, STD’s, anti-conception, pregnancy, mother and child health, dreams and ideas about future and family. We plan to build a bridge towards the villages. We will therefore build in upcoming years a Community Terrace right next to the Women’s Workplace, where dance and body work will be done. By working on body and soul after a while we will have a more relaxed atmosphere between the Kajsiab Women and it will be more easy to do the workshops to the villages. To be able to build this Terrace we will need to buy the land next to the Women's Workplace. Kajsiab is still looking for funding . The whole Kajsiab Team and all Kajsiab women thank you for your ongoing support and encouragement and for taking the time to read through the information about the important work we do. Thanks to you a dream is becoming true and the dreams for the women of the mountains are slowly developing and becoming a reality. Friends of Kajsiab, Kajsiab Team thanks all of you from the deepest of our hearts.